Maria is the founder and director of The Bike Campaign and Bike Garage in Woodland California, a non-profit, volunteer, self-sustaining bicycle advocacy organization and "bike kitchen" making it possible for anyone to own and ride a bike. The organization's #1 goal is to reduce car trips to schools and workplaces while improving quality of life for everyone. 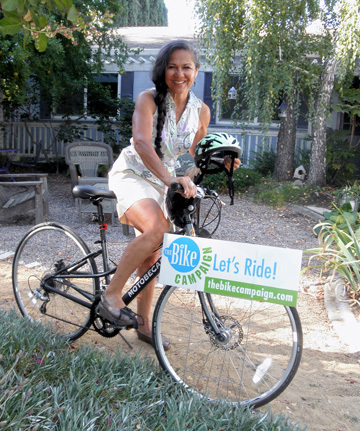 Maria grew up in, and currently resides in Davis, California which is a Platinum rated Bike Friendly Community. She began her work in Woodland, only 10 miles away where almost no one rode a bike "unless they had a DUI" she was told. Through the combined efforts of city leadership and the support of The Bike Campaign, Woodland has received a Bronze-rating from the League of American Bicyclists and is going for the Gold. In her own hometown, thousands of students come from all over the world to UCDavis with very little training on how to use a bike as a primary form of transportation. This has spurred a big increase in the number of bicycles being repaired, refurbished and resold at the Bike Garage as well as providing more Free Bike Clinics and bike education for large groups of university students. "When it comes to bike advocacy," says Maria, "there is plenty of work to be done in Yolo County and I look forward to seeing many more kids riding their bikes to school in the future."